High Gothic castle founded in 1348, which has a unique position among Czech castles. It was built by Czech King and Roman Emperor Charles IV as a place for safekeeping of the royal treasures, especially Charles's collection of holy relics and the coronation jewels of the Roman Empire. The first stay of Charles IV in the castle is documented in 1355 when he came to supervise the building works as well as the decoration of interiors, especially the castle chapels. The construction of the castle was finished in 1365 when the Chapel of the Holy Cross situated in the Great tower was consecrated. At the outbreak of the Hussite wars the castle became the place for safekeeping of the Czech coronation jewels, which were kept here, with the exception of several short-time breaks, for nearly 200 years. The castle was reconstructed in late Gothic style after 1480 and in Renaissance style in the last quarter of the 16th century. 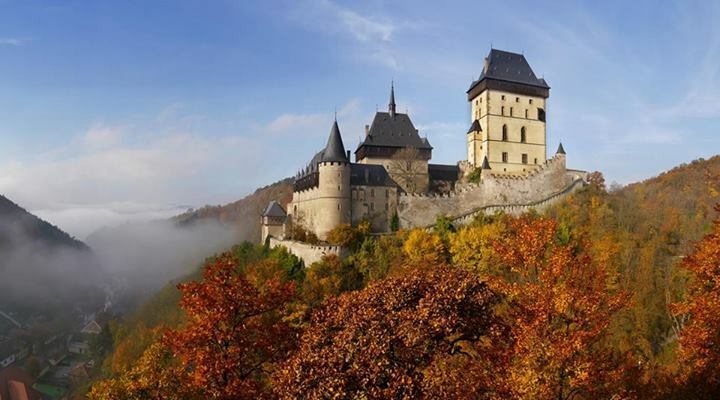 The present appearance of the castle comes from the last reconstruction, which was carried out in the puristic neo-Gothic style by architect Josef Mocker at the end of the 19th century. Very impressive is the original step-like order of buildings. From the Well tower and Burgrave's palace located as the lowest you walk up to the majestic five-floored Imperial palace and further up towards the Marian tower. And finally at the top of the headland stands the monumental 60m high and separately fortified Great tower.